The career of Michael Jordan is rich with exciting and memorable moments. His first amazing moment occurred in game 5 of the 1989 NBA Playoffs Eastern Conference first round against the Cleveland Cavaliers. The series had been hotly contested going into final and deciding game. Both teams had won a game on the road and Jordan had scored no less than 30 points in each of the first four games. The Cavs had firepower on their side as well with Mark Price, Ron Harper and Craig Ehlo. On May 7th, 1989 in Cleveland, Ohio the stage was set for this historic game. The fans of Cleveland had been criticized by the media for not being as excited and as loud as the Chicago fans, they were alive and loud for game 5 however. As the game started the Cleveland faithful cheered their team to an early lead. The Cavs were on top from the great play making of Ron Harper and Mark Price. The Bulls only lead once in the first half and it was in the middle of the first quarter. The Cavs would take the lead back and stay in the lead until the middle of the fourth quarter. In the first half Jordan was somewhat cold going only 5-13 from the field with 14 points. Bill Cartwright and Horace Grant forced themselves to the bench by getting into early foul trouble. The Cavs looked ready to finish off the Bulls in the second half when halftime started. The Second half is when Jordan became a major factor in the game. He basically had no choice but to step up due to Cartwright and Grant sitting on the bench most of the third quarter. The Bulls took the lead half way through the fourth quarter and then the game got even more insane. With both teams trading the lead leading up to the final 2 minutes. With 1:07 left in the game Scottie Pippen who had struggled throughout the game finally showed up and hit a clutch 3 pointer to put the Bulls up 97-95. Craig Ehlo would match him with a 3 pointer of his own and the Cavs were suddenly in the lead by a score of 98-97 with :50 on the clock. Just 44 seconds later Jordan hit a jumper from the free throw line on an assist from Pippen putting the Bulls ahead 99-98. The game looked all but over until Ehlo made a layup for the 100-99 lead with only 3 seconds remaining in the game. The Bulls coach Doug Collins called a time out and positioned Jordan for history. Center Brad Sellers in bounded the ball to Jordan who was in 3 point territory. Jordan took the ball up about twelve feet and hit “The Shot”. Craig Ehlo tried desperately to block Jordan’s shot but was unsuccessful. The clock ran to :00 as the ball made it through the hoop. Ehlo has been made part of history in video clips of Jordan celebrating this moment while Ehlo collapses on the sideline in defeat. The Bulls were headed to the next round and the city of Cleveland had another heartbreaking sports moment to add to their long list of disappointments. Jordan was the leading scorer in the game with 44 points, 30 of which came in the last half of the game. The next highest scoring player from either team was Craig Ehlo who had 24 points off the bench. Mark Price also had a really good game with 23 points many of which were crucial 3 point shots. 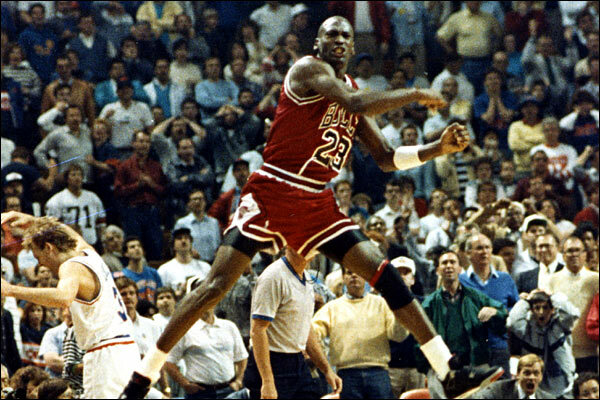 Michael Jordan and the Bulls went on to beat Patrick Ewing and the New York Knicks in the second round of the Playoffs. They would later fall to the Detroit Pistons in the Eastern Conference Finals. But this moment would become the history that Jordan and the Bulls were built on. The Bulls won their first NBA title two years later and the rest is history.